When I made the transition from a compact digital camera to a digital SLR last summer, I knew there was going to be a lot to learn. The instruction manual that came with the camera did not give enough information, and I have since been looking at books that could help me to take better quality photographs. 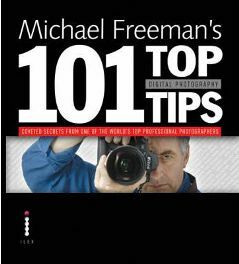 Perhaps the best I have looked at so far is Michael Freeman’s “101 Top Digital Photography Tips”. The quality of the paper and the superb design of the book immediately draw you to it, but as you start to leaf through the pages you realise that there is much more to it than the look and feel. It delivers on information for all levels of photography, whether you just point and shoot or you are a professional. Although the book is a series of 101 tips, these are organised into nine chapters covering topics such as Color, Technicals, Stitching, Multi-Shot and Processing. It’s obviously not a book that you have to read from cover to cover. A novice will no doubt benefit from reading the first chapter entitled Basics whereas a more experienced photographer may be looking for expert advice on efficient overlaps or recovering highlights and shadows. You do occasionally come across a tip that refers to a process that was described in a previous one, for instance in the explanation of crowd-removal sequences Freeman comments that “both the principle and the practice are the same as for noise removal.” In this case it would obviously make sense to go back and read the section on noise-removal sequences. Most of the tips cover a double-page spread, although there are some that are confined to a single page. The proportions of text and illustrations or diagrams vary according to the nature of the tip. Tip number 33 concerns unified colour; it has two of the book’s largest photographs alongside half a column of text. One of the photos shows fresh green rice stalks, on one of which perches a beautifully camouflaged praying mantis. To the right is a gloomy monkey with blobs of snow on his hands and feet; the background shows the blue of an early evening sky reflected by the surrounding snow. Freeman comments here that some photographers might be tempted to “correct” the blue, but he feels that it adds to the atmosphere of coldness and fading light. At the other end of the scale, tip 7 in Chapter 1 entitled “Workflow questions you should ask” covers a single page and there are no illustrations at all. Nevertheless, the text is set in columns and broken up into easily digestible chunks. Freeman stresses the importance of planning your workflow here, since with digital photography we are responsible for all stages of the process, from shooting images and backing them up to processing and then displaying them. After tip number 101 comes a glossary of not 101 but 102 photographic terms. (I don’t suppose that there was any particular significance to the total number.) Included here, to give a few examples, are bracketing, diffusion, grayscale, lasso, reflector and soft-box. Following a two-page index, the book concludes with a page giving a bibliography and useful addresses, all of which are in fact websites such as PhotoImpact, Pantone and Adobe. I was able to borrow a copy of this book, but it contains such a wealth of information and advice that I am intending to buy a copy for myself. Although many of the tips are technical ones, the style of writing is straightforward and easy to follow. If you do come across a term that is unfamiliar to you, you will more than likely find a definition of it in the glossary. The fact that almost all the tips are so well and so appropriately illustrated will be a huge bonus for visually oriented people. There may be experienced photographers who are already knowledgeable about many of the tips presented here, but it is unlikely that they will not find any sections that will help them to improve some aspect of their photography. For anyone seriously interested in photography, this is a book I would definitely recommend owning. I would personally find it a little too heavy to carry around, but it is a book that I would benefit from being able to refer to at home for many different aspects of photography. Michael Freeman is a renowned international photographer and writer whose principal fields are travel, architecture and Asian art. He is an expert in special effects. He has contributed to many magazines and has published more than two dozen books on photography. No Comments on "Michael Freeman’s 101 Top Digital Photography Tips"